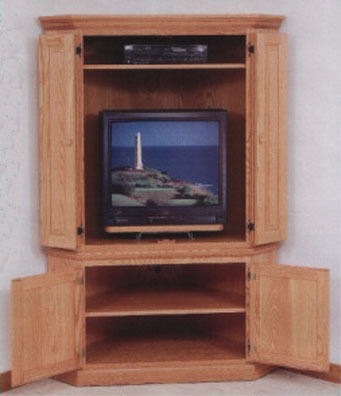 For those who want an entertainment center that is a little less imposing, the Amish have made our 71” corner entertainment unit - shown here in solid oak. Similar in most respects to our 79” large model, but a full 8” shorter, which makes room for some audio or video components on top, or that center channel speaker that’s always so hard to find a spot for. This one eliminates the drawer in the bottom, but gives you two adjustable shelves instead, and it still includes the solid oak raised panel doors at the bottom, and bi-fold doors on the top. It also uses the same 200 lb. rated slide out swivel as the higher end units, and our Amish builders have used a smaller version of the same decorative moulding at the top. This unit is still large enough that it comes in two pieces - top and bottom, to make moving it easier.